The minimum rate for pensions in Argentina only covers 40 percent of pensioners’ basic needs. After last year’s pension reform the purchasing power of the lowest pensions has an accumulated regression of 8.58 percent. | Photo: Reuters | Photo from teleSUR. 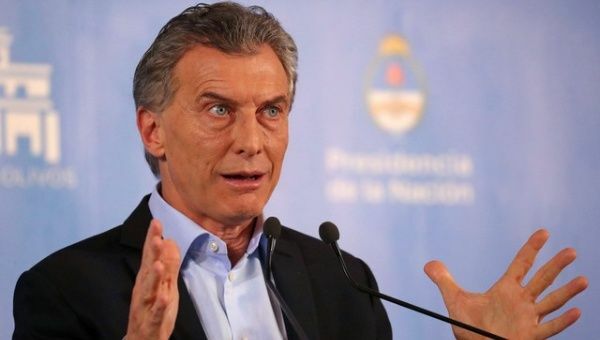 21 August 2018 (teleSUR)* — Argentina’s ombudsman for senior citizens, Eugenio Semino, said Monday [20 August 2018] that seven out of every ten senior citizens with a pension are unable to cover their basic expenses. With the situation worsening according to Semino since the rate of pension increases currently lag behind rising inflation. According to their estimates, the increases in the prices of food, medicine, and home utilities place the value of the market basket for senior citizens or pensioners at 21,127 pesos (roughly US$707). However, in September the lowest pension will go from 8,096 to 8,637 pesos (US$290), which covers less than 40 percent of those expenses. The office of the ombudsman for senior citizens has calculated the pensioners’ market basket every six months, for ten years. “When there are high inflationary peaks, like in 2014 and 2016, we do an extra calculation in the month of August. This calculation is made for the pensioners who live in urban centers,” Semino explained in an interview with a local TV station. The situation is even worse for those who receive non-contributive pensions and the universal pension for senior citizens, who receive around 6,000 pesos (US$200) a month. “In Argentina, no one can live with 8,000 pesos, and we are talking of a universe of seven million retired people,” ombudsman Eugenio Semino said. Pensioners have demanded the national government to take urgent actions against the social effects of the country’s economic crisis, which is a consequence of rising inflation and currency devaluation. In the last six months, the price of medicine that is not provided by social works has increased by 30 percent. “Minimum pensions must be in accordance with the price of the basic market basket. This should be guaranteed by using part of the flow of the Sustainability Guarantee Fund,” Semino argued. Analysts expect the situation to worsen due to rising inflation and loss of income and employment, and the austerity measures agreed on by Mauricio Macri’s government and the International Monetary Fund, which includes the gradual dismantling of the Sustainability Guarantee Fund. “The fund, instead of being available to multilateral financial institutions, should be in the only safe place: the pockets of pensioners, where it generates taxes, jobs and internal consumption,” Semino told Pagina 12. The UK is on route to become just like this.